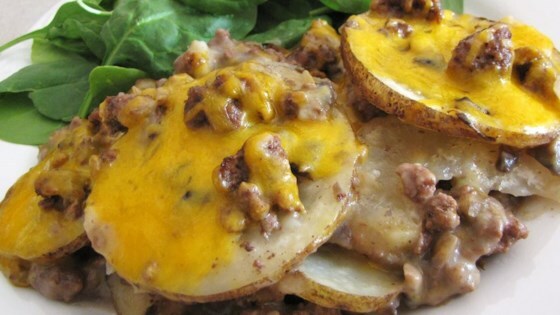 "This is a recipe that my Grandmother used to keep me and my finicky cousins well fed! It is very kid friendly, and adults like it too!" In a medium skillet over medium heat, brown the ground beef; drain fat. In a medium mixing bowl, combine cream of mushroom soup, onion, milk, salt and pepper to taste. Alternately layer the potatoes, soup mixture and meat in a 11x7 inch (2 quart) baking dish. Bake in the preheated oven for 1 to 1 1/2 hours, or until potatoes are tender. Top with Cheddar cheese, and continue baking until cheese is melted.